VANCOUVER — Mary-Anne Bowcott says she still remembers the fear she felt when she overheard her co-workers talking about her while she was a roofer. It was violent enough to make her consider leaving the industry all together, like so many other tradeswomen she knew. “It was horrific. It’s something one should never hear,” she said in an interview Friday. It wasn’t the first or last time she would be the subject of inappropriate behaviour, but Bowcott said she’s happy she persevered because she now has a career she loves. She celebrated the announcement of a new code for the construction industry Friday that aims to attract and keep more women in the construction trades. The Building Code widens the definition of safety beyond physical concerns to include stress or distraction caused by discrimination, bullying, hazing or harassment. It also gives employers tools and training to promote safe behaviour. 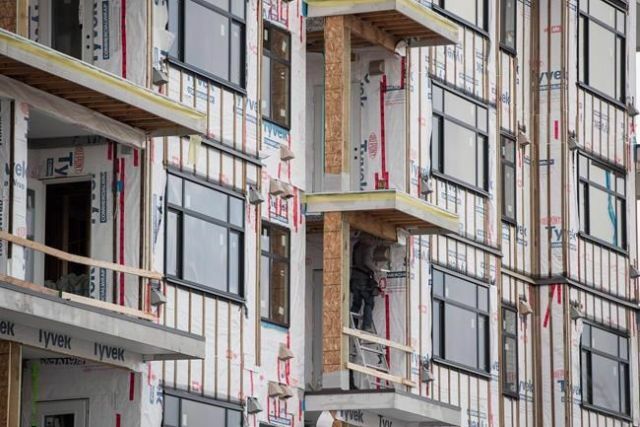 The province and the BC Construction Association said the code includes the goal of having 10 per cent of skilled trade jobs held by women by 2028, which they say would be a first for a Canadian province. Currently, 4.7 per cent of building trades workers in B.C. are women. To reach the goal, another 9,500 women would have to join the workforce, the association said. “We need to drive aggressive agendas because five per cent of women in the trades isn’t good enough,” Melanie Mark, minister of advanced education, skills and training, said at the announcement. The association said it is also trying to retain women in the workforce at a time when the province is suffering from a skills shortage of 7,900 workers. More women are entering the trades than ever, but retention rates remain low, the association said. Anecdotally, it estimates fewer than half of women stay in their apprenticeships in the first year, compared with 70 per cent of men. Andy Calitz, the CEO of LNG Canada, said the company is committed to supporting equity and diversity, adding that half of the company’s leadership team are women. Bowcott, who is now owner-operator of Westcom Plumbing and Gas, said she’s happy she persevered and pursued a career in the industry. “We’re going in a positive direction here and I really hope that it does make a difference. We need workers and I think we have an untapped market we can expand into,” she said. She said she knows her experience wasn’t unique. When she was on the executive of the BC Tradeswomen Society, some women told her they were afraid to walk to their cars alone at the end of a shift. Things have gotten better in the past 15 years, she said, but there’s still space for improvement. While she couldn’t say definitively if there’s a gender wage gap, she once discovered she was paid less than a male journeyman with the same experience in the same position, she said. Bowcott also said she hopes to change perceptions that men are better at trades because they tend to be bigger and stronger. “I’m 100 pounds soaking wet, and I can do the job just fine. So I don’t think it should be a stereotype that you have to be a super strong fit woman to do the jobs out there, because a lot of it is brains,” she said. The announcement on International Women’s Day was also supported by a number of other agencies including the Industry Training Authority, WorkSafeBC and the BC Construction Safety Alliance.